One of the Participant at the stakeholder meeting of the port operation, with respect to Ease of Doing Business Initiative of the Federal Government have raised some concerns over how Nigeria Custom Service (NCS) and terminal operators are frustrating this great initiative of the government. He alleged that the NCS after disputing their own Pre-Arrival Assessment Report (PAAR), they raise a Debit Note (DN) with penalty of 25% of the debit note sum on the importer, which put a lot of financial burden on the importer. He requested that NCS should clarify this issue and also plead with the committee on the Ease of Doing Business to come to their rescue at the Apapa Port. It was also allege that it takes the NCS about 3-5 working days to raise a DN and will like to know the reason for this delay. He went ahead to complain that the terminal operators do not refund the un-utilized days paid upfront for storage charge. For instance, importer pay the terminal operation a storage charge for 7 days and get the goods cleared and moved out of the terminal in 4 days, the remaining un-utilized 3 days is never refunded. This he regards as extortion and should be stopped. He also went ahead to state that terminal operators charge importers for all the days they were unable to position container for NCS examination. This again is another strategic extortion because the importer is paying for the inefficiencies of the terminal operator, he said. 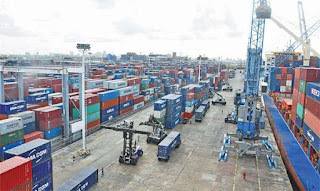 He finally stated that goods released by NCS and cleared from the port facing multiple blocks and check points in transit to importer's storage especially between Port Harcourt and Aba, Port Harcourt to Onitsha and Port Harcourt to Warri. All these are a gamut of issues that totally negate the spirit of Ease of Doing Business of the government and stakeholders are requesting that the Presidential Enabling Business Environment Committee (PEBEC), should look into this in order the make port operations change for the better for both importers and exporters in Nigeria. 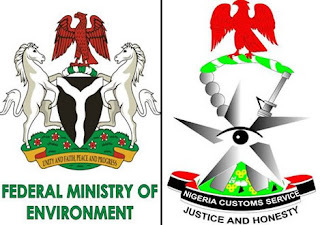 Wood Export: The Federal Government Finally Has Defined The Term "Processed Wood"
The federal government has finally cleared the air on the controversial issue regarding export prohibition on the website of the Nigeria Customs Service (NCS). This was made know to the public the representative of the (NCS) at an interactive session on non-oil export organized by the NEXIM Bank in conjunction with the Lagos Chamber of Commerce and Industry (LCCI). The NCS has for a long time stipulated on its website that one of the items prohibited for export in Nigeria is Timber (rough or sawn). This has become very controversial because the term "processed wood" was not clearly defined. This has made many banks to reject the request to process pre-export documentation for wood. The wood exporters also face a challenge with the customs because they choose not to use NXPs for their shipment since the bank failed to process the document. This should finally laid to rest the concerns of the commercial banks in Nigeria on the issue of processing NXP for processed or semi-processed wood. The bank can also go ahead to ask the exporter to provide this approval as part of the pre-export documentations. 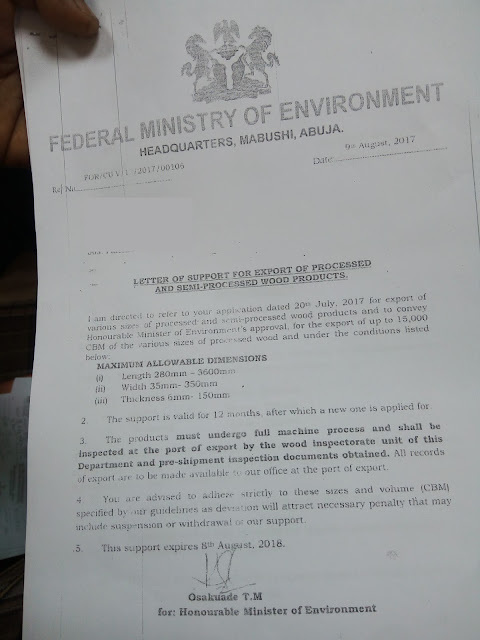 A copy of the approval from the federal ministry of environment has been attached below for the review of our esteemed readers. 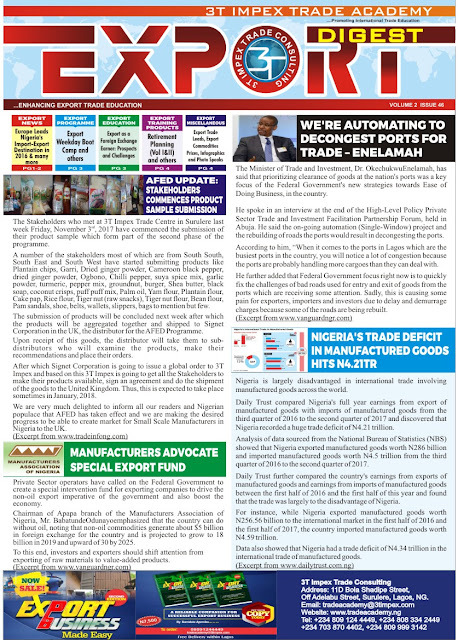 The implication of all the issues that I raised in the first part of this article last week is that, since a good number of the trade staff in Nigerian banks are not certified trade professionals, they are not in touch with the current trends in the world; their staff only learn from superiors who transfer the same ignorance and errors from one generation of staff to another, they do not either understand or have distorted knowledge of the provisions of international trade rules like UCP600, ISBP, URR725, URC522, ISP98, URDG758 etc. This in turn means that Nigerian banks are sitting on the keg of gun powder in most of their trade transactions. The fact that this has not exploded does not mean all is well. As a matter of fact, a number of issues that occur in the trade transactions are either kept under the wrap from the eyes of the management or they transfer the liability to customers who are also oblivious of what the bank has done to them. Some of these issues are seen in the way the three principles that guide the SBLC and Demand Guarantee are being flagrantly violated in the drafting and issuance of the instruments. A number of times you see a letter of credit transaction financed by the bank is issued with ordinary inspection certificate requested as part of documents to be presented without further information. On several occasion, I have had issues with three of the Tier 1 banks who interpreted an "extend or pay" demand as an substantive demand for payment and thus causing a lot of outrage in the bank even at a very high management level. They even went as far as asking me to recall the letter and request for extension of the Guarantee as if I am the applicant. Even when the cost is very high for the customers, the only solution they propose to mitigate political or economic risk is Confirmed Letter of Credit, when there are cheaper, faster and better options. Many will give customers to accept the draft on a tenored Bill for Collection with 'pour aval' stated on it when they are not ready to guarantee that the importer will pay at maturity and so many other dangerous mistakes. A number of Bankers who really would like to advance their careers by doing these trade certification programmes are not encouraged by either their banks of their superiors at works. Many do not have time for themselves not to talk of time to read and prepare for the exams. There is no room to even take your annual leave not to talk of examination leave. A number of young Bankers do not have the money and their banks are not willing to pay for them either because there is no provision for such or because if they become certified, some small minded bosses becomes threatened. Those that were able to squeeze out time and money to do these exams have refused to go for Re-Certification after three years because the bank did not recognise them as a subject matter expert either covertly or overtly by their redeployment to other units where these skills will be useless. It is amazing that there are almost 10,000 globally recognised certified trade finance professionals in the world and we have just about 70 of them altogether in Nigeria and yet they are neither celebrated nor appreciated. 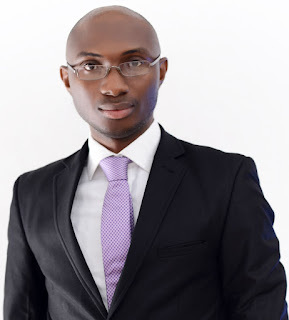 To solve these problems, all we need is to replicate the model that has been working and entrenched in some top accounting firms in Nigeria like PWC, KPMG, EN etc. 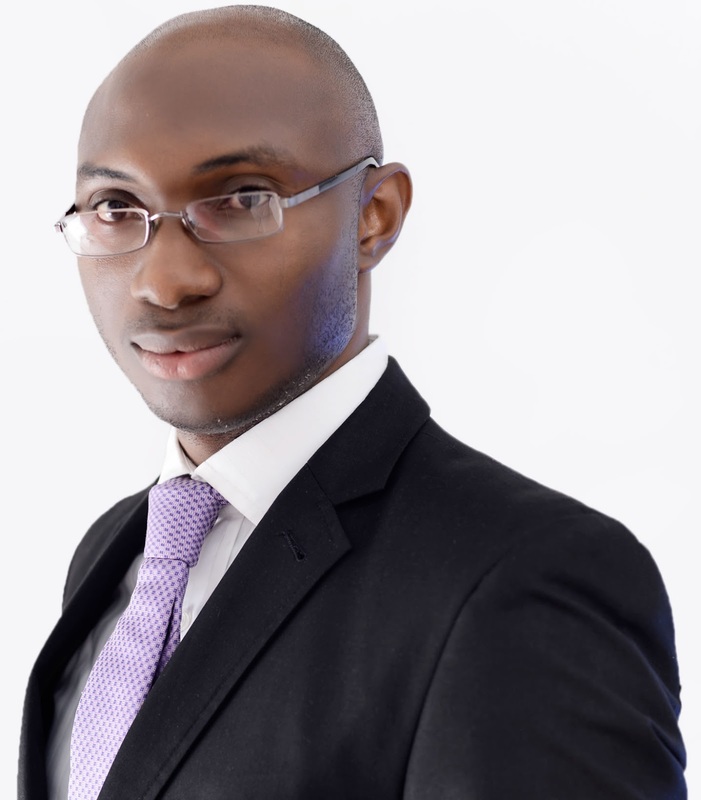 They ensure that you have a target of when you will become a chartered accountant from the time you join them. They give you study leave to prepare for the exams and also pay the examination fee when you complete all the stages. This model varies from one firm to the other, but the summary is that, they support their staff to become certified professionals. These makes all the top and middle management staff to certified experts and thus encourage and if necessary compel the young and junior staff to pursue this goal until it is achieved. Therefore, if the management of the Nigerian banks can compel the head of trade related services like trade operations and trade finance to have this certification as a prerequisite to head the units, it will naturally trickles down to all the staff under them. Staff that have passed these exams should be encouraged, celebrated and also appreciated in the way they are treated in the units. In conclusion, it is my hope and aspiration that Nigeria will one day, become a major trade hub in the world with hundreds or even thousands of certified trade finance professionals that will drive the trade volume to an enviable height and also sustain this through their skills in structuring and implementation of different trade process reengineering and numerous trade finance programmes and initiatives. In This Week's Edition of Export Digest Newsletter - FG Budgets N19.3bn Export Grant Amid Alleged Abuse. 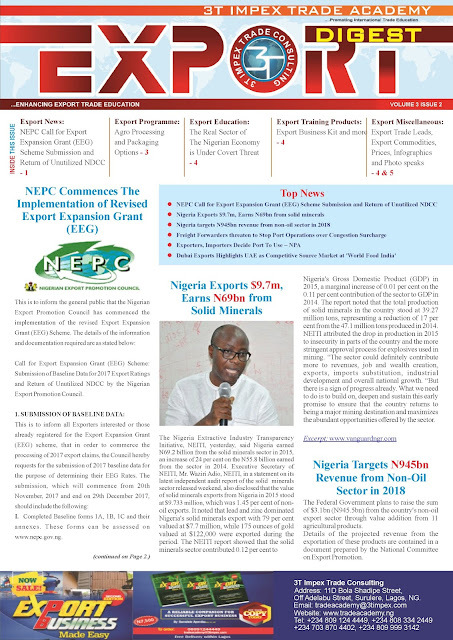 Call for Export Expansion Grant (EEG) Scheme: Submission of Baseline Data for 2017 Export Ratings and Return of Unutilized NDCC by the Nigerian Export Promotion Council. I. Completed Baseline forms 1A, 1B, 1C and their annexes. These forms can be assessed on www.nepc.gov.ng. II. Audited Financial Statements, which must include Value Added Statements for the respective base years. Export Expansion and Export Expansion Plan (EEP), in line with Revised Export Expansion Grant Scheme. V. Baseline application and all accompanying documents must be scanned in a single PDF file, saved in a flash drive and forwarded with the application. a. Photocopies of Financial Statements are not acceptable. Any photocopy must be duly endorsed by the Company’s Auditor, using the Auditor’s seal. b. Companies, submitting baseline data for the first time should in addition to the above, submit their Financial Statements for 2014, 2015 and 2016, if applicable. c. New companies should submit their current Management Account and Projected Financial Statements for 2018. 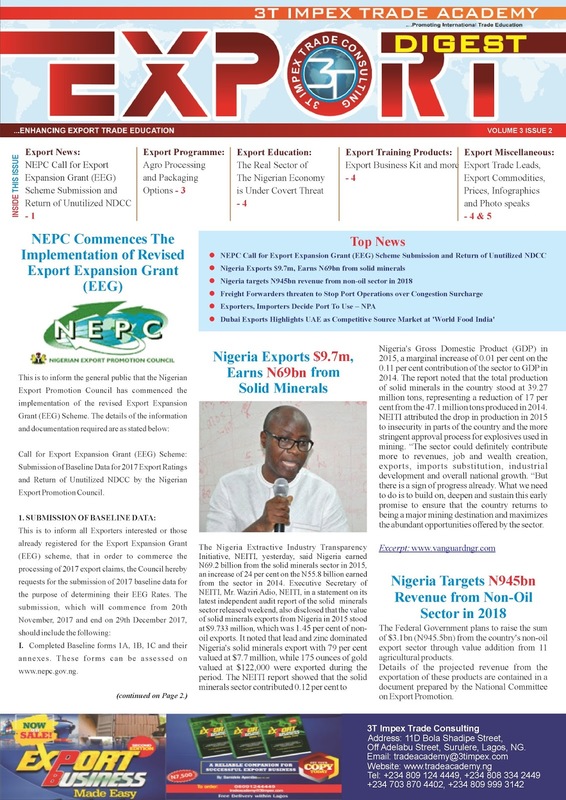 In line with the new policy guidelines of the Federal Government that outstanding (2007 2016) backlog claims settlement under the Export Expansion Grant (EEG) Scheme be accommodated as part of the Promissory Notes Payment Program (PNP), all beneficiaries that are in possession of un-utilized NDCCs are expected to return them to the Nigerian Export Promotion Council, These returns are to ensure adequate verification of the unutilized Certificates in preparation for the implementation of the Promissory Notes Payment Program. The return of the unutilized NDCCs exercise is schedule to commence on 16th November, 2017 and close on 22nd January, 2018. All Exporters are please advised to adhere strictly to the Revised Guidelines and the time schedules for the submissions, as late and or inadequate submissions will not be entertained. All submissions must be addressed to the Executive Director/CEO, NEPC. Banking is a very noble institution that take funds from people, places projects where it is excess supply and channel into people places and projects where funds are in short supply, thereby making the dreams of different people from various places handling different projects come to fruition. In carrying out this core function, one of the skill that is extremely critical for the bank's survival is risk management. A Bank that fails to develop the staff in the various units that manage its risk is sitting on the keg of gun powder, which will explode sooner or later. As a matter of fact, most Banks that has gone into the archives of history and no longer exist in our world today commence their decline into oblivion because of their recklessness in risk management. In this article, my focus is going to be on Risks that are associated with international trade transactions. Trading generally in the local market has its inherent risks but when it comes to trading across borders, a layer of risk is added to the existing risk of local trading and this requires skills in relevant trade finance instruments to mitigate. Some of the common trade finance instruments being used in Nigeria and other parts of the world include Letter of Credit (LC), Bill for Collection (BC), Demand Guarantee (Guarantee) and Standby Letter of Credit (SBLC). Out of these instruments, the most prevalent ones in Nigeria are Letter of Credit and Bill for Collection. From these two instruments, only Letter of Credit is suitable for financing trade without the support of another trade instruments. However, the recent global trade finance report of the International Chamber of Commerce (ICC) has revealed that the usage of Letter of Credit has been declining since after the global recession that plagued the last 2-3years of the last decade. The usage of this instrument went up a bit between 2012 and 2013, but it has been on a consistent decline since then. The usage was measured using the MT700 messages (The message type on SWIFT that is used for the issuance of Letter of Credit) sent out to different banks in the world via SWIFT (Society for World Wide Interbank Financial Telecommunications). There was a decline of 2.50% in 2014, a further decline of 3.76% in 2015 and finally a decline of 2.81% to an 8 year low in 2016. In all, the Letter of Credit usage has decreased by over 4.3 million from almost 48 million in 2013 to about 43.5 million in 2016. This has been attributed to a number of factors and the predominant of this is the delay in payment and clearing of the goods which results from the over 70% prevalent rate of documents discrepancies in Letter of Credit transactions all over the world. This stunning statistics should drives a typical trade professionals anywhere in the world to begin to ask the questions, how then do we secure trade transactions in the world if the usage of Letter of Credit is decreasing at this rate? The answer to this question is Standby Letter of Credit and Demand Guarantees. The usage of these two trade finance instruments has been on the increase in the same period of decline in the usage Letter of Credit. This is because they can be easily combined with other payment methods like Open Account and Bill for Collection, which thus eliminate the delay of discrepancies that is often experienced in Letter of Credit transactions. All these changes should therefore make a forward-looking trade professional and Bankers that structure trade finance to begin to position themselves for this new trend by acquisition relevant skill through various certifications. The case in Nigeria is however different despite the fact that a number of trade instruments (like Letter of Credit, Standby Letter of Credit and Demand Guarantees) are issued regularly, few Bankers in Nigeria understand these instruments and very few are certified trade finance professionals. As a matter of fact, the level of incompetence of Bankers in handling these instruments always very obvious whenever I request for it in any of our trade transactions. This actually results from them being ignorant of the rules like International Standby Practice (ISP98) and Uniform Rules for Demand Guarantee (URDG758). There are two major global trade finance certification programmes that can help Bankers to sharpen their skills in the usage of these instruments. These include Certified Documentary Credit Specialist (CDCS) and Certified Specialist in Demand Guarantee (CSDG). Both of them aid better understanding of Standby Letter of Credit while the latter boost the skills of Trade Specialist in Demand Guarantee. 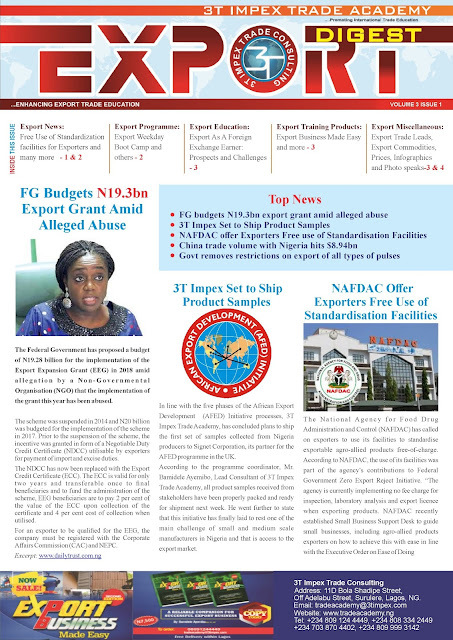 However, it is very risky to note that despite the volume of the trade instruments being issued daily in the country and increase in the usage of SBLC and Guarantee in particular, Nigeria only has 58 certified trade professional in LC and SBLC and just 11 certified trade professionals for Demand Guarantee. It is particularly more risky among the Tier 1 Banks who handles most of these transactions and have just 16 certified trade professionals. One of this top banks who used to have about five currently do not have any certified trade specialist in Letter of Credit probably because their bosses are not certified and thus feel threatened. This makes them to be taken out of the unit and deploy them to other departments like marketing and sales units. 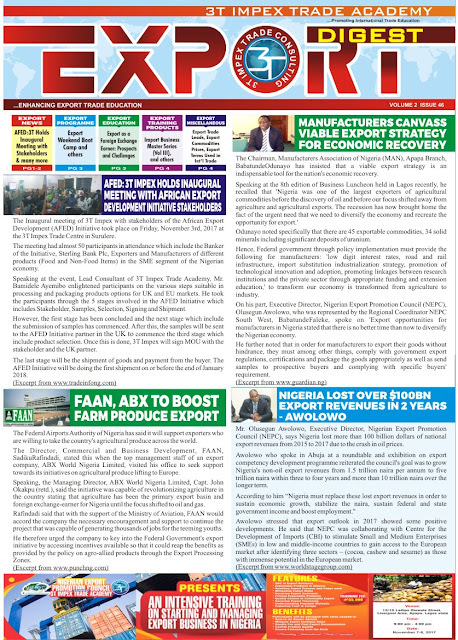 In This Week's Edition of Export Digest Newsletter - How AFED Initiative Will Change the face of Exportation in Nigeria. The Real Sector of The Nigerian Economy is Under Covert Threat. It is no more news that Nigeria is an Import dependent country. This is mainly due to the low level of development in the economy. When it comes to examining the risk of importation to a country, we seem to only focus on the impact on foreign reserve and the nature of the items being imported and not so much is being said on where we are importing the goods from. In my opinion, I think the Real sector Nigerian economy is seriously susceptible to a major risk called concentration risk because of the over dependence on China as the major source of our items of importation into Nigeria. The economist will tell us that the economy of any nation comprises four interrelated sectors, operating to ensure that resources are best utilised in the production of goods and services to maximise the welfare of its citizenry. The sectors are the financial, fiscal/government, external and real. While all four sectors have important roles in the welfare of the citizenry, the role of the real sector is particularly significant and strategic. It is the sector responsible for the production and distribution of goods and services (from a combination of factor resources), necessary to meet the consumption demand of an economy. It drives economic growth and development, and provides an indication on the living standard of the citizens of an economy and the effectiveness of government’s macroeconomic policies. Furthermore, it facilitates the creation of economic linkages with other sectors and helps in capacity building, employment and income generation. In view of this, a discussion of the real sector is topical as it is the pillar upon which the government’s objective of inclusive growth and poverty alleviation hinges, since it contributes the most to employment generation and growth. However, the real sector of the Nigerian economy is under threat and no one seem to be observing the trend and bring it to the front burner and hence nothing is being done about it. The wise man see evil afar off and do something to avert it but fool will wait until it he feels the impact before doing something about it. In 2015 in particular, Nigeria imported goods worth $39.5Billion and from different parts of the world. Out of this, about $13.6Billion worth of goods were imported from China and this accounts for about 35% of the total import into the country. What is of interest to me in this particular year is the fact that a good chunk of the products inputs at different levels and stages to the manufacturers and processors in the country. For example, out of this $13.6Billion, about $2.37Billion was used for the importation of machines and spare parts, $1.18Billion was used to import metallic and minerals which are raw materials in industries, about $748Million was used to import raw materials for the plastics and rubber industries while about $577Million was spent for the importation of other raw materials that are chemicals. A number of people might argue that, the reason why many people are flocking to China to purchase what they need for their factory is because if of the competitive prices. To the extent that this is true, however, I think the government has the responsibility to look beyond profitability and focus on the impact of this concentration risk on the economy. If this trend continues unchecked and China experience any form of political issues, (which is already gathering momentum based on the proposed sanction from the USA on China to stop its trade with North Korea) that has an adverse effect on its economy, then all the factories that solely depend on China might be in for a very hard time. The implication of over reliance of the manufacturing sector of the Nigerian economy on a single country is far reaching. An adverse situation in the politics and economics of China might mean a decline in the importation of raw materials and spare parts. This might consequently leads to the reduction in product output and thus leading to a decline in income and profitability of such organisation. The result of all these is retrenchment of workers and increased unemployment in the country. A government that is forward thinking will not wait until things get out of hand but rather put processes and system in place to mitigate this before it becomes too late. Some of the things the government can do is to first commence sensitisation among the players in the concerned sector of economy to let them know the implication of what they are doing to their business and the economy in general. In addition to this, the government can use some of the tools at his disposal to discourage over reliance on China and encourage the purchase of similar products from other parts of the world. Some of the government tools that can be very effective to get this done is Tariff, Tax holidays, VAT exemption, Import Origin Quota etc. It is my firm belief that if these tools are dynamically and strategically deployed, then we can effectively avert the likely doom that could “bedevil” the Real Sector of the Nigerian economy very soon. However, if we continue on the current path of unabated increase in the dependence of the critical sector of our economy on importation from China (or any other country), then we may be in for a very hard time if this risk crystallises.